Plenty of talk these days about the importance of Brand Evangelists. Or Ambassadors. Or Employee Advocates or, …minions. I’ll admit the idea makes me uncomfortable. Not because I don’t think employees should be outwardly proud of where they work, or that the ‘brand Kool-Aid’ is poison. And it’s not because I don’t think that the employees—people directly connected to delivering the brand experience—aren’t some of the most valuable champions of the brand. Plenty of great organizations benefit from authentic, internal cheerleaders. But from where I sit, the prevailing push behind ‘evangelists as strategy’ wisdom conflate enthusiasm against obligation in the realm of social media, underscored with the ugly falsehood that social media is “free”. It’s empty as a strategy—unmeasurable and accidental if truly authentic. To top it off, all of this is happening just as we’re moving towards greater transparency and accountability from leaders. I believe pure brand evangelists—the concept—are a tremendous value. They mark a significant success in your brand strategy. I disagree, however, that expecting all employees to perform on social media—demanding, even—is smart strategy. And I believe that compelling them to perform is disingenuous; a slap in the face of the very authenticity good leadership is striving to achieve. The strategy for any organization should be to create opportunities, not obligations, to share content and experiences. Organizations should trust employees to respond appropriately—as an insider in the community—and arm them with relevant contributions (or at least give them access). The strategy should leverage enthusiasm, not attempt to create it. The strategy for any organization should be to create a SoMe profile that borrows from the people who accept the role of monitoring and responding. Their individuality will enhance the brand, not distract from it, and it should be clear that the brand is the anchor of the engagement. The strategy for any organization should be to create a culture rooted in pride and enthusiasm. The organization should be passionate about transparency, ensuring that the Evangelist mindset has access to content and insights, and isn’t blindsided by facts outside their control or knowledge. Nothing screams ‘faker or flakey’ like an ill-informed insider. The strategy for any organization should be to think beyond marketing, and let any department show up in relevant social media channels, sharing and learning. There are countless communities that would appreciate authentic participation—engagement that moves the whole community forward—not just the “sell”. The strategy for any organization should not be to overlay ‘evangelist’ into every job description and expect everyone to blur their personal and professional profiles to serve the organization. The strategy must not have vague expectations nor imply unrewarded activity. The strategy must never compromise anyone’s integrity, and the organization doesn’t get to decide when such concern is valid. Brand Evangelism is a result of your culture, not a technique to create one. If your organization benefits from employees who freely promote, support, defend and engage, then you can thank a strong culture, not a ‘Brand Evangelist Strategy’. You’ve invested in people you can trust and depend on, and now you get to reap the rewards. In fact, if you have truly developed a culture worthy of brand evangelists, good luck stopping them from engaging beyond your expectations. However, if you find you must request ‘evangelism’ from your team—or worse, demand it—then you haven’t earned the value that the phenomenon of the ‘brand evangelists’ offers. You don’t understand the concept, because if you haven’t taken the time to nurture the culture, good luck trying to get any authentic evangelists at all. And authentic brand evangelists is really all that matters. In this world of expert teams—groups of people who are each smart enough and wise enough to lead—it is ever more important to follow with integrity. While we routinely debate the merits and qualities of leadership and its impact on productivity, often missing from the conversation is the importance and obligation of true teamwork; following the leader. If we expect good leaders trust their teams, it is only logical that good teams trust their leader. When an individual is given the title of leader—both the glory and the burden of being accountable for results—it becomes imperative for teams to acknowledge and support the leader. Too often when uncovering the problems with teams, it comes down to followers who aren’t quite willing to follow. Every plan has a flaw; every decision meets a “yes, but…”; every criticism has an excuse. Poor followers are caught up in their own ego, more concerned with eventually being the saviour of the situation (a perceived need, not a real need) than trusting that the leader is making good choices. Poor followers aren’t really following. They are riding the coattails to success—going through the motions with an agenda all their own. Poor followers gather information but hold it close for personal gain. Poor followers agree in their words but reject in their actions. Poor followers fixate on the plan without focus on the goal. Poor followers stand among the team but have an agenda of self-preservation. Poor followers believe they have the wisdom to lead, but lack the courage to risk leadership. Poor followers are eager to hear feedback, but quick to find excuses. Ultimately, poor followers lack conviction, and let apathy and arrogance undermine their actions. Failure becomes a self fulfilling prophecy; not because the plan lacked strategy or leadership lacked ability, but simply because the they didn’t fulfill their follower role with integrity. This isn’t about blind allegiance, or recklessly abandoning good sense and objectivity. There is a time and place for questions and contradiction; there is room for tough discussion in search of excellence; it is important to disrupt the status quo. But when planning transitions to action, and everything that we’ve prepared for is on the line, it is time to let leaders lead, and support them—support the whole team—by acting as an excellent follower. Know the goals and know the plan; share information; respect decisions; act with conviction. Strong Brand Strategy is rooted in leadership and trust. It takes teams of people committed to a common purpose, unafraid to tackle the challenges of bringing their vision to light, but also unafraid to work together. Strong brands demand diligent teamwork. If we truly expect leaders to lead with integrity, it is only fair that leaders expect followers to follow with integrity, too. The word ‘diversity’ gets tossed around a lot these days. Few would argue that diversity—however it shows up in your organization—is adding value. The dictionary definition of Diversity is “a range of different things”, and talk of diversity in the workplace always celebrates the inclusion of people and ideas that are outside of our typical circles. The concept implies a whole array of useful traits that, in theory, will make any idea a better idea: different experiences; fresh perspectives, inclusive insights, varied wisdom, extended capacities, … well, the list goes on. Simply put, an organizational culture that embraces diversity will be better for it. Popular wisdom encourages us to welcome new perspectives to collect and build upon our own insights. “Listen and be open-minded” is the paraphrased rally cry of the diversity bandwagon. But simply gathering ideas isn’t the true power of diversity. Diversity is exponentially stronger when it’s an active mindset, not a passive one. Diversity is not just about letting others in. Diversity is about encouraging yourself to go out to find something bigger. Diversity seeks out new ideas and differing perspectives. Diversity doesn’t let you get comfortable with your status-quo. Diversity craves ideas and insights that differ from our own because we are aware that we can’t see our own limits. Yes, you have to let other ideas into your frame of thinking. But that is only half of the path to diversity—and it’s the easy path. For a full experience and benefit, you must also seek diversity out for yourself. You must make the time and effort to reach for diversity a priority, and part of your culture. Brand Strategy thrives on growth and development. Part of the promise we make to stakeholders is that we will continue to push and evolve the brand story, rewarding loyalty with deeper experiences and new adventures. Encouraging diversity—both welcoming and searching new ideas—is how we actively discover the potential of the brand. Good brand strategies know they should adopt new ideas. Great brand strategies go looking for fresh thinking. Passion is not a line item in your budget. Neither are values. “We’re not like Disney” is a common line people use, usually as a rebuttal against intensive brand development (or they toss out McDonald’s, Starbucks, Nike, etc..). In the world of brand strategy, those famous consumer brands are the de facto benchmark for “a real brand”, as though good and bad is measured on scale, not connection. While there is no question most organizations don’t have anywhere near the budget for brand execution that a Starbucks or an Apple has at their disposal, there is no line item in the balance sheet for your passion or commitment to real, compelling values. Conviction—passionate belief in your values as a competitive advantage, and the conscious effort to live them—isn’t something that you can buy or trade. You have access to just as much passion as the famous brands, your competitors, and even the failing brands. You’ve got all the passion you’ll ever need, if you believe it. Core values—holding people accountable for their actions in service of your mission—isn’t a budget issue. It’s a culture issue. And it’s free. And that’s the catch. Do you really want it? Do you truly believe it? Are you really committed to creating and delivering an experience that is compelling, driven by values that are truly engaging? Are you really committed to standing for what you believe is important and creating an experience that authentically expresses—and lives within—your core values? Do you really believe that what you offer is worthy, in spite of all the competitive options or differing opinions? Or perhaps you just thought core values were a convenient message; the right words that are popular enough to compel to a suitable target audience. Perhaps you don’t filter every act through your established sense of right and wrong—the culture you’ve defined as important—and hold everyone accountable. When challenged, you believe values will bend if they offend. Or perhaps you feel that passion takes too much energy and investment. Sure, you believe in what you’re doing, but you don’t believe people need to “drink the Kool-Aid” to show an unnatural sense of enthusiasm. Maybe you conflate passion with hype, letting ‘marketing’ lead the bandwagon of cheerleaders. Proof of passion—being excited about what you stand for and confident in your purpose—takes a big, bold, in-your-face expression, and you’ve got a bottom line to watch. Too often people barter their core values and passion with excuses. They’ll find excuses for why they can compromise their values in a given situation, or why only some people in the organization are responsible for passion. Note: excuses also feel free, but actually put a massive lien on your credibility. Brand Strategy is about attaching values to the experience you promise. Brand Strategy is about defining your core values, and inviting people who share those values with you. Brand Strategy—the kind that adds value to your organization—is about creating a distinction with purpose and meaning. 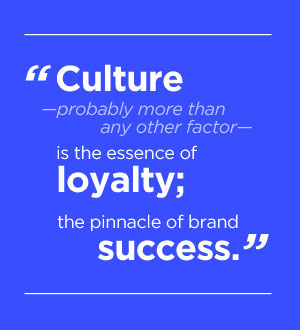 Culture—probably more than any other factor—is the essence of loyalty; the pinnacle of brand success. So a positive culture, one that reflects the values of the org and serves the goals of the your mission, actually adds value to the bottom line. And it’s free. Easy money, …if you want it. Passion and values are the seeds of the culture you build, and they are at the foundation of Brand Strategy. And they are free. A buzzword is only a buzzword because you believe it is a buzzword. There are two types of buzzwords. The first is a form of concept blindness; a word or phrase that captures an idea in a concise way, and becomes common language. An example would be ‘thinking-outside-the-box’. The second is essentially linguistic abuse; when the placement of the word is so overused that the meaning is cluttered and pointless. An example shared with me today is ‘agility’. Both of these buzzwords are a weapon of weak strategy. Buzzwords are often show up as a cover for confusion and discomfort rather than insight, and typically at the expense or ignorance of fundamentals. In turn, mediocre teams embrace buzzwords like a weapon, unleashing disruption on true insight. Used recklessly, the buzzword is damaging to discussion, let alone strategy. Buzzwords occur at the tipping point; that moment when an idea is gaining momentum faster than people are understanding the concept. It is a dangerous place where leadership and innovation (buzzwords in their own right) can stretch too far from reality, believing they have buy-in and consensus (buzz-buzz) when all they have is a veneer of understanding. Knowing when to confront a buzzword—a deep push for clarity and understanding—is the mark of true leadership and an intelligent team, and critical to smart strategy. However, calling out a buzzword merely for being a buzzword has become common practice; a broad stroke rejection of the buzz at the expense of the insight. Rejecting an idea because it’s a buzzword is as dangerous a place as living blissfully in the buzz. Perhaps even more so, because it is often accompanied by a sense of superiority and arrogance that is damaging to both the idea and the culture. When you reject a business concept because it’s a buzz word, you are as much of the problem as the people who used it so much and so incorrectly it became the buzz word. You’re reacting the buzz, not the meaning or value of the concept. There are many buzz words in use today. Whether it’s a new management philosophy, the latest consultant fad trend, corporate double-speak, or just plain old over-hyped mindsets, a word becomes buzz-worthy when the value of the word overrides the value of the meaning. Buzzwords, though, can be incredibly valuable. Almost every time, the concept that launched the buzzword has merit. Ignore the concept at your peril. When we take a moment to make sure the meaning is clear—and we aren’t afraid to ask for clarity when we hear the buzz—we start to build strength in our communities (buzz). Familiar words and phrases that haven’t achieved (or surpassed) buzz status are at the foundation of strong culture. A common language among peers becomes a shortcut to understanding, and integral to connecting within shared values, vision and knowledge. Meaning-in-context is one of the most powerful roots of connecting. A strong culture—one connected by a common language—is at the foundation of a strong brand strategy.